Railpictures.ca - Michael Berry Photo: CP 414501 is a 250-ton self-propelled wreck crane built by Industrial Brownhoist that is preserved at Exporail. Lurking in the background is control cab CP 1100, originally C-424 CP 4236. | Railpictures.ca – Canadian Railway Photography – photographie ferroviaire Canadienne. 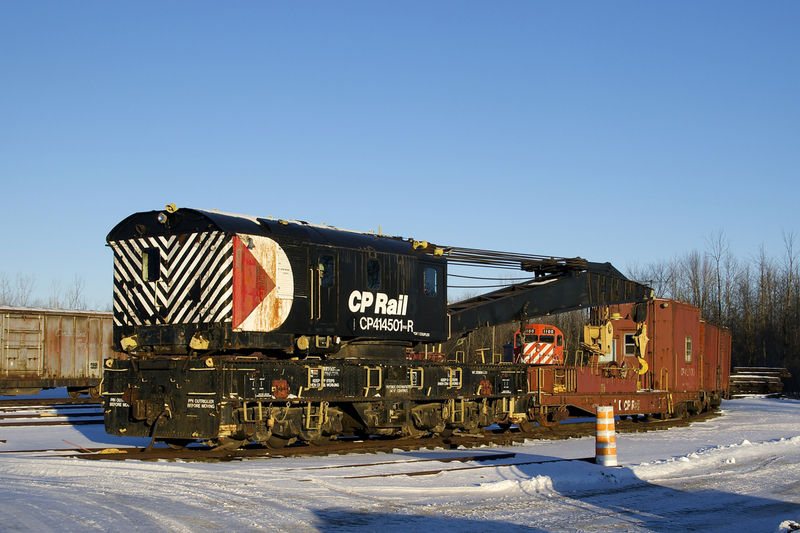 Caption: CP 414501 is a 250-ton self-propelled wreck crane built by Industrial Brownhoist that is preserved at Exporail. Lurking in the background is control cab CP 1100, originally C-424 CP 4236. CP 414501 is unique for a very peculiar reason. It was built as a steam powered wrecker in 1946 and serial numbered 11729. That same year, a 250 ton crane was also constructed for the Atlantic Coast Line Railroad and it received serial number 11729. This crane, last numbered CSXT 985250 was in private ownership as recent as 2012. (information gathered from American & Ohio Locomotive Crane archive files during my tenure with the company).